The following series of posts will be about analysing the impact and use of Wikipedia by organisations. For convenience I have used the example of the Natural History Museum (NHM), as it's the one I am most familiar with. Doing such studies on an unfamiliar organisation might prove difficult. The linkypedia project set out to answer these kinds of questions. A local installation of linkypedia, with modifications, has been used to generate the statistics presented here. All links are from pages on Wikipedia to pages on the domain http://www.nhm.ac.uk/. One (probably flawed) measure of an organisation's Wikipedia impact is the number of page views on Wikipedia pages that reference that organisation. The following data are total page view from December 2007 to December 2012 (and ignores the fact that these pages might not have had links for all of this time). There's a pretty good correlation between this list and things the NHM is known for, I guess some people might be surprised that homoeopathy makes the list but the link is to a debate between Peter Fisher and Ben Goldacre held at the museum. 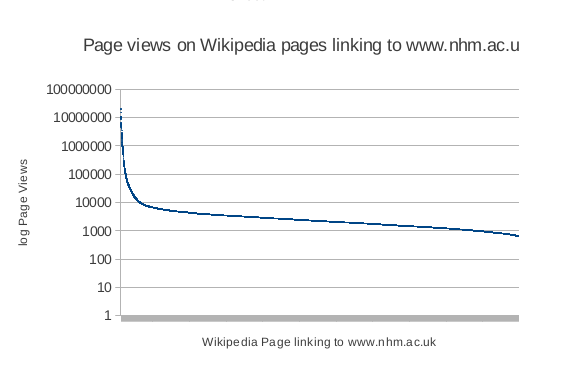 The graph below shows that of the 13,000+ articles linking to www.nhm.ac.uk most are in the long tail of page views, and relatively few articles with links to the NHM have over 1,000,000 page views. Another way of measuring Wikipedia impact might be to see how many links to an organisation's website there are on pages that relate to the organisation's core activities. The following table shows the Wikipedia articles with the most links to the NHM's website. Most of these are species or genera or months, so there is some obvious scope for improvements in other areas of study. (In fact there are a few thousand stub articles on lepidoptera that have little more than a link to a catalogue on the NHM website). Chris Stringer is a member of NHM staff, and the Wildlife Photographer of the Year is owned jointly by the NHM and the BBC. Measuring the Impact of Wikipedia for organisations (Part 1) by Ed Baker is licensed under a Creative Commons Attribution 3.0 Unported License. Just so I don't forget! Organised by Ed Baker (me) & Sarah Faulwetter to set a framework for future development of the Scratchpads BioBlitz profile (demo site) and the HCMR's ViBRANT deliverable of a Citizen Science module for Drupal. Workshop Day 1: What can we learn from successful citizen science projects? What would be useful for us to do and how we might be able to engage with existing projects? What user-groups exist, how are they served by existing projects, and who can Scratchpads/ViBRANT target? 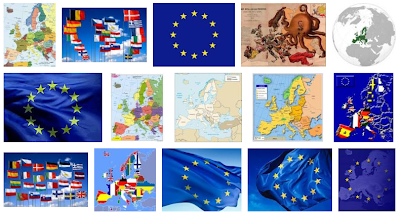 What are the outcomes of these projects (fun/educational awareness/scientific data)? What quality of data can be collected? 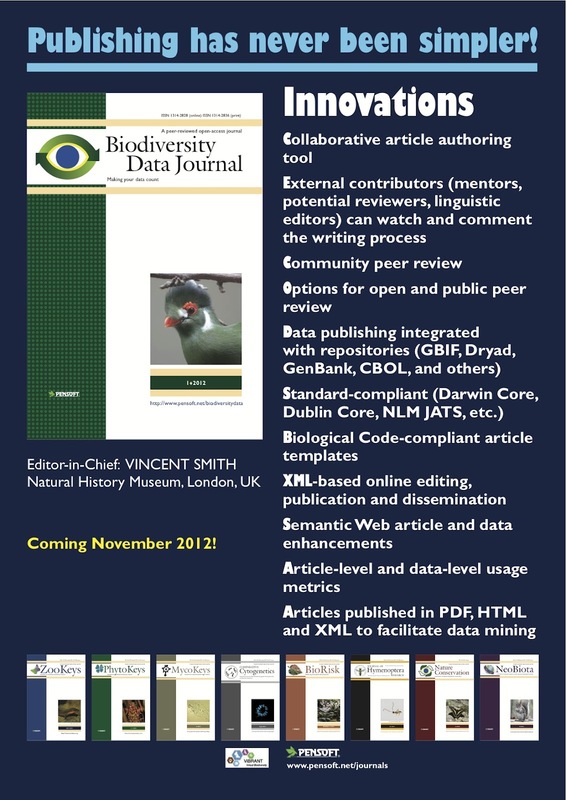 How can data gathered be reused (Biodiversity Data Journal/GBIF/EoL)? Can we incorporate citizen science tools into Scratchpads in general (e.g. 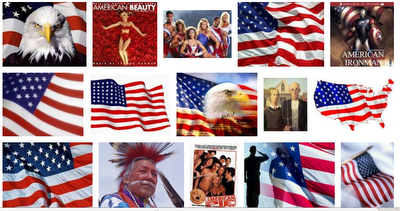 crowdsourcing image transcription). Last Friday we had a ViBRANT sponsored workshop about CartoDB, the open source mapping and visualisation product from Madrid/New York based Vizzuality. The context of the workshop was possible integration of CartoDB with the Scratchpads and OBOE projects in the context of visualising biological datasets. The notes for the workshop demonstrations are here and are what the work done here is based on. Not having a suitable dataset to hand I have been playing with making maps of the photos I have shared on Flickr. Flickr does provide a map view of a user's photographs (here's mine) although it is very limited in functionality - and unless you only have a handful of photographs you can't get a map view of all of your photographs. I have previously visualised my Flickr stream by hacking the Drupal flickrsync module to save geolocation data with the Location module. Even with clustering the map points for 7,000+ images the results are slow to load: Drupal Flickr map of my photographs. The plus side of this work was that with just modifying the output of the view I could get a CSV file of my Flickr stream which I easily imported into CartoDB. Finally using some PostGIS I was able to make this map a little more accurate by splitting the countries into separate polygons (e.g. separating Hawaii from the continental United States, Northern Ireland from Great Britain). Become part of an expanding team of developers working at the cutting edge of information science and biodiversity research. The Natural History Museum London is recruiting a Drupal developer (fixed term until end of November 2013, £34,853 per annum plus benefits) to work on the Scratchpad project (http://scratchpads.eu) as part of a major effort to help researchers share and manage biodiversity data on the Web. Applicants should be able to work on their own initiative and be proficient in module development, theming and quality assurance. Mentored training and support will be provided. Successful applicants will work with members of the developer and user communities to manage and parse biodiversity data, in addition to helping with the design, construction and testing of Drupal modules and sites. The project includes opportunities for international travel as part of the development team. Applicants should have at least 1-2 years experience in Drupal development (version 6 & 7) with hands on experience configuring Views, CCK and other contributed Drupal modules. This includes working with PHP, MySQL, SQL, XML, HTML and CSS. If you have a profile page on Drupal.org, please make reference to this within your application along with Drupal websites you have developed. Absolutely, Positively, Strictly - NO RECRUITMENT AGENCIES. 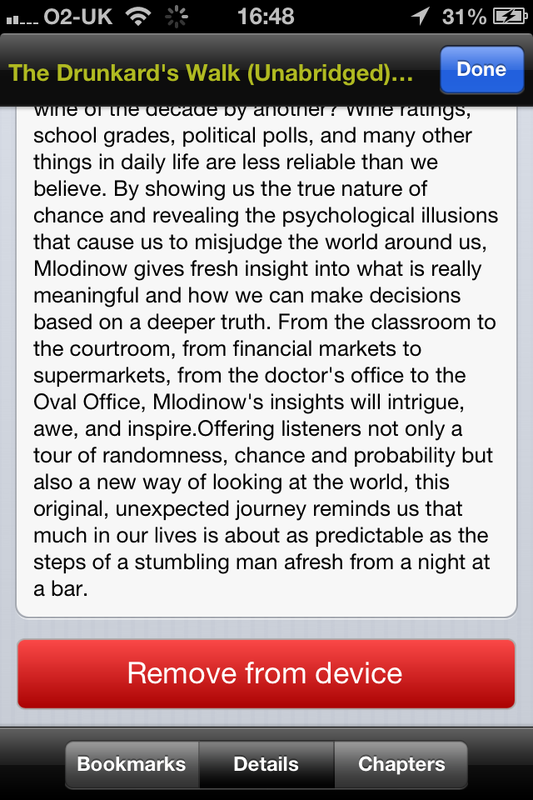 This is an annoying bug I have found in the latest Audible for iPhone app. 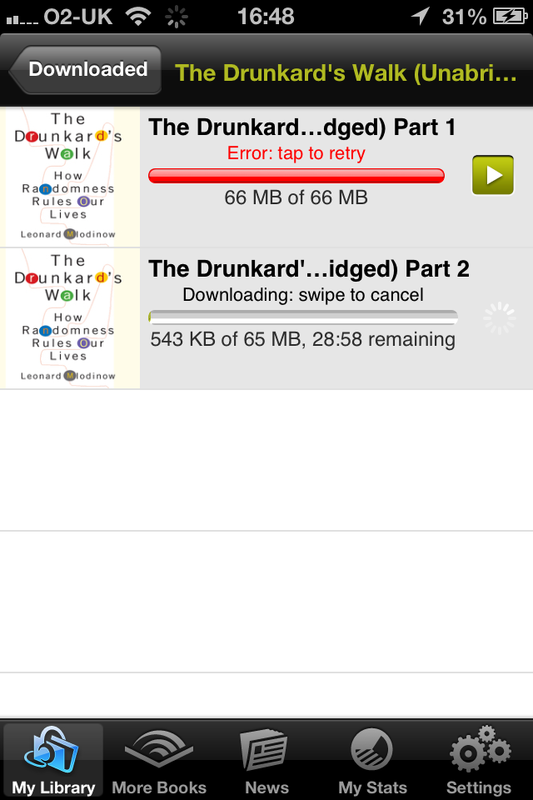 Audiobooks seem to download entirely but the fact they have finished doesn't seem to register with the system. The result is the app crashes when you try to play them (or on start up) and you can't delete the files from your library. Everything is fine however if you are offline. This problem can be fixed by turning your phone into airplane mode in Settings, and then reopening the app. You can now play the audio files without the app crashing - but it is still not possible to delete them from your Library, it is however still possibly to delete them via the Now Playing / Last Played screen. Play the troublesome file and then click the button in the top right of the screen to bring up the Bookmarks/Details/Chapters screen. Select the Details tab and scroll to the bottom of the page. 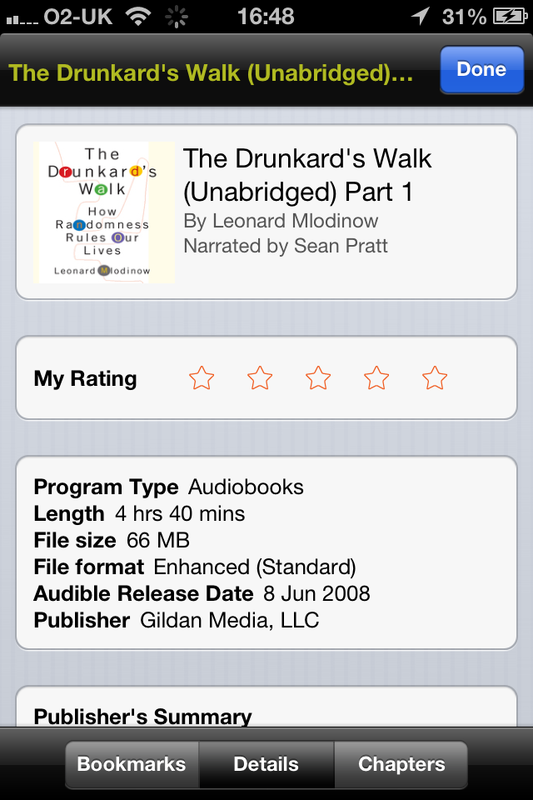 You can now remove the problematic audiobook from the device. You can then download it again after turning off airplane mode and everything should be fine. This problem seems to occur when downloading from patchy connections and/or when the app is downloading in the background. I've recently been playing around with using the NBN Gateway webservice to implement something along the lines of ZipCodeZoo or the Postcode plants database. This project will involve using NBN Gateway data to provide a list of species for a given taxonomic group within a few kilometres of your location (more later). Smartphones and modern browsers are able to report their current location for use in such services, bit what if you want to check what species are found near your home while you're at work? Being able to use post codes would be an additional nice to have feature. As part of the UK Government's Open Data initiatives the Ordnance Survey have released Code-Point Open - which is essentially a series of CSV files with data that allows you to move from a postcode to an OS Grid Reference. The download of this data package contains in the Data folder 120 CSV files, named after the first text portion of the postcode (some information of the structure of UK postcodes). 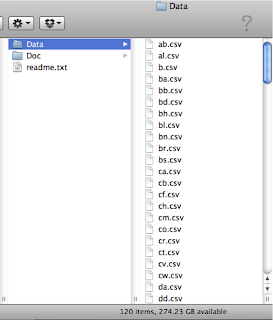 The resulting all.csv file is pretty large (156MB-ish). 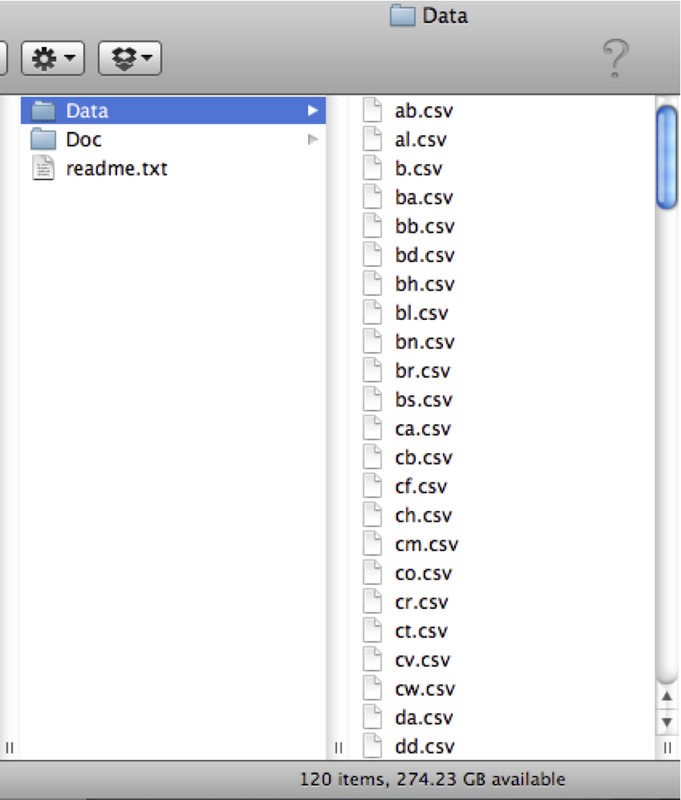 Calling it aall.csv instead of all.csv just puts it at the top of the list which appeals to my aesthetic sense. 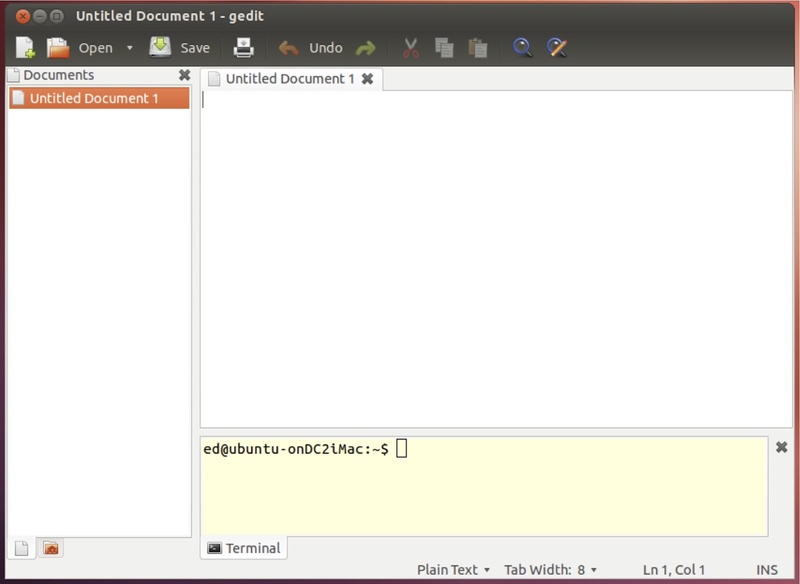 uncheck 'use-theme-colors' and then restart gEdit. 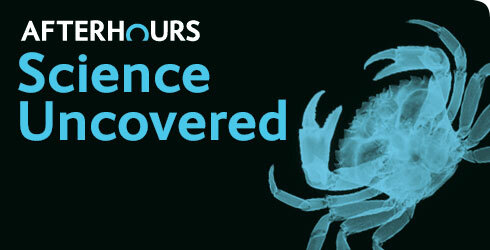 For the third year in a row the NHM will host Science Uncovered as part of European Researchers' Night. "At Science Uncovered 350 of our scientists and visiting experts will gather across the Museum's galleries and outdoors in a fabulous show of displays, tours, experiments, challenges, discussions and more. This is a unique chance to interact with the latest scientific research and experience the Museum in a festival atmosphere. We have 6 bars and The Restaurant open on the night. Hot and cold food is available. Our Museum in Hertfordshire joins in with its own Science Uncovered at Tring event. European Researchers' Night is a European Commission initiative. The Museum would like to thank the Commission for the opportunity to participate in this event." "Following four years of highly charged debate, the rules for publication of scientific names of animals have been changed to allow electronic publications to meet the requirements of the stringent International Code of Zoological Nomenclature. In a landmark decision, the International Commission on Zoological Nomenclature (ICZN) has passed an amendment to its rules that means a publication in an electronic-only scientific journal will be ‘legitimate’ if it meets criteria of archiving and the publication is registered on the ICZN’s official online registry, ZooBank." 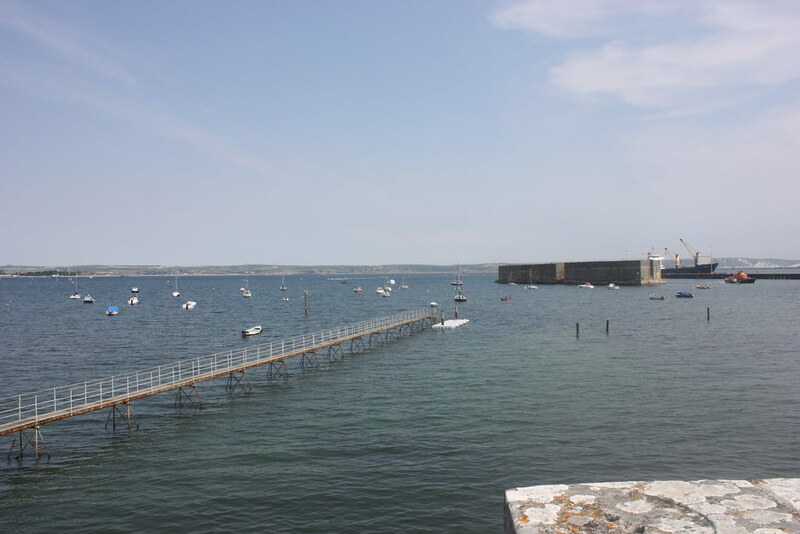 Part of a tour of locations owned or managed by English Heritage (part 1 of many): Portland Castle - built in the 1540s as one of the Device Forts to protect the natural harbour of Portland from the threat of invasion from the French and Spanish. 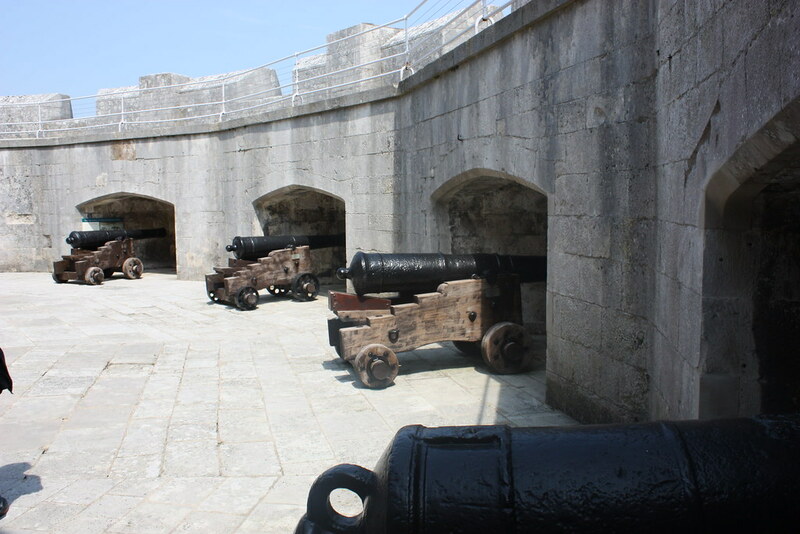 The Castle has a squat design to minimise target area and curved walls to deflect incoming fire. The key to this are the two functions field_read_instance and field_update_instance. This can also be used to modify any of the other available properties of the field instance (apart from the entity_type, field_name and bundle). 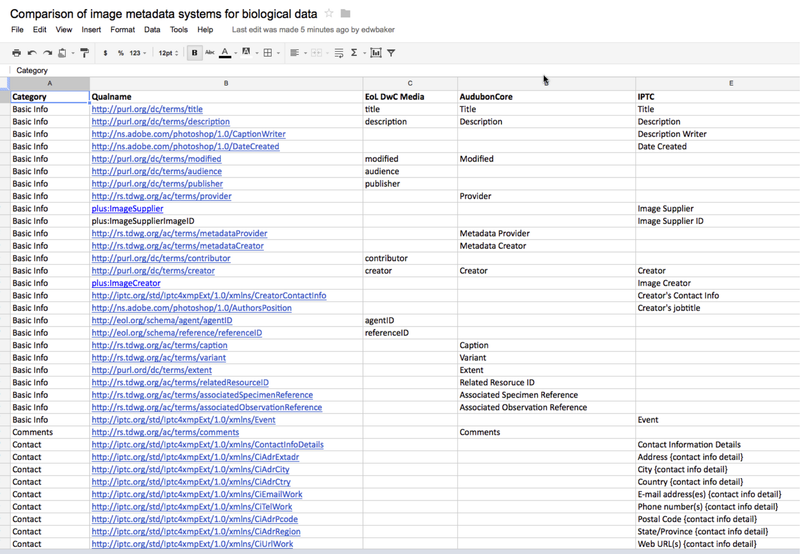 As part of the eMonocot and Scratchpads projects I have been doing some research to help us decide what metadata we will allow users to add to media by default. For images the International Press Telecommunications Council (IPTC) standard is generally considered de facto. While it forms a good basis for the curation of metadata of biological images and videos, in itself it is inadequate. Two schemes for extending this basis are the EoL Media DarwinCore extension and the more comprehensive Audubon Core (a proposed TDWG standard). In order to compare and contrast these three standards to aid in our decision making I created this spreadsheet which may be of use to others. 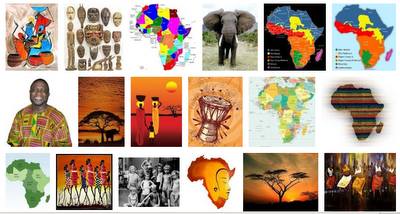 This year we will be meeting at the Natural History Museum, London on Wednesday, 7th November from 14:00 to 20:00. Details of the venue at the museum will be sent out with the draft programme in September. The meeting will be convened as a special interest group of the Royal Entomological Society and everyone is very welcome to attend whether to present research or just to listen and meet other orthopterists. This year, as last, we are aiming to put together a programme which will have a mixture of presentation lengths. Both initial results and ideas, as well as completed research are welcome. 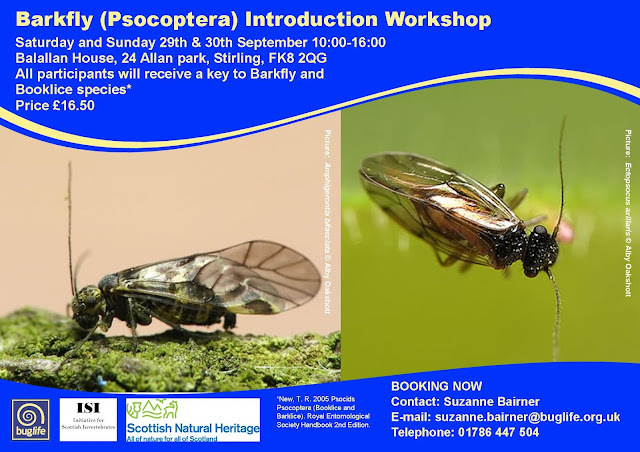 You can offer talks or posters on grasshoppers, crickets and related groups (cockroaches, earwigs, stick insects, mantids). There will be space to display posters and other exhibits as usual, and computer projector facilities will be provided. To date, we are expecting talks on cockroaches of the genus Ectobius new to Britain, the mobile phone Orthoptera key, the new Orthoptera atlas, and communication in Speckled Bushcrickets (Leptophyes punctatissima). The copy date for the next issue of the RES magazine Antenna is 31st July and while we realise that this is very short notice, if you know you would like to present something please let us know as soon as possible so details can be included. The total cost will be £12 per person to cover tea and biscuits during the afternoon and a cold buffet with wine at about 18:00. We hope that you will be able to attend the meeting. Please see below for registration details. the title of any talk or poster you would like to give, details of specimens you will bring with you, etc. Please also let us know about any particular display equipment etc. that you require. £12 to include tea and biscuits and a cold buffet with wine. Ms Kirsty Whiteford, Senior Administrator, Royal Entomological Society, The Mansion House, Chiswell Green Lane, St Albans, Herts, AL2 3NS. Royal Entomological Society, sort code 30-97-25, account number 01921533. Please ensure that you include your name and “Orthoptera SIG” for reference. Pay by debit or credit card over the phone. Please phone Kirsty on +44 (0)1727 899387. Overseas visitors will probably not be charged or can pay on the day. Become part of an expanding team of developers and informaticians working at the cutting edge of information and biodiversity research. The Natural History Museum London is recruiting an e-Taxonomy support specialist (14 month, part time, £16,403 per annum, pro rata equivalent to £27,339) as part of a major effort to help researchers share and manage biodiversity data on the Web. The successful applicant will manage the help system for Scratchpads, be the primary point of contact for user enquiries, assist in the development of user support functions and engage in outreach and promotional activities. As part of this work we encourage the successful applicant to develop a Scratchpad for their own project research using taxonomic content they have acquired through research activities. This post would ideally suit a taxonomist with practical experience managing taxonomic data and an interest in eTaxonomy. This is a part time post equivalent to 3 days per week. Become part of an expanding team of developers working at the cutting edge of information science and biodiversity research. The Natural History Museum London is recruiting two junior/mid-level Drupal developers (18 month contracts, £34,508 per annum plus benefits) as part of a major effort to help researchers share and manage biodiversity data on the Web. Applicants should be able to work on their own initiative and be proficient in theming, coding, configuring and quality assurance. Mentored training and support will be provided. Successful applicants will work with members of the developer and user communities to manage and parse biodiversity data, in addition to helping with the design, construction and testing of Drupal modules and sites. The project includes opportunities for international travel as part of the development team. I'm going to this - feel free to come too. Is the Internet really making taxonomic information more accessible to its many actual or potential users? Certainly much effort is being made to put such content online, but how effective are we in achieving this end? This one-day meeting, with its line-up of international speakers, aims to provide an update on progress. It will feature a number of substantive online taxonomy initiatives and a critical review of the current position. The meeting will address the question of whether users’ needs are being met and will conclude with a talk (also serving as an Evening Lecture) on the use of informatics in related disciplines. 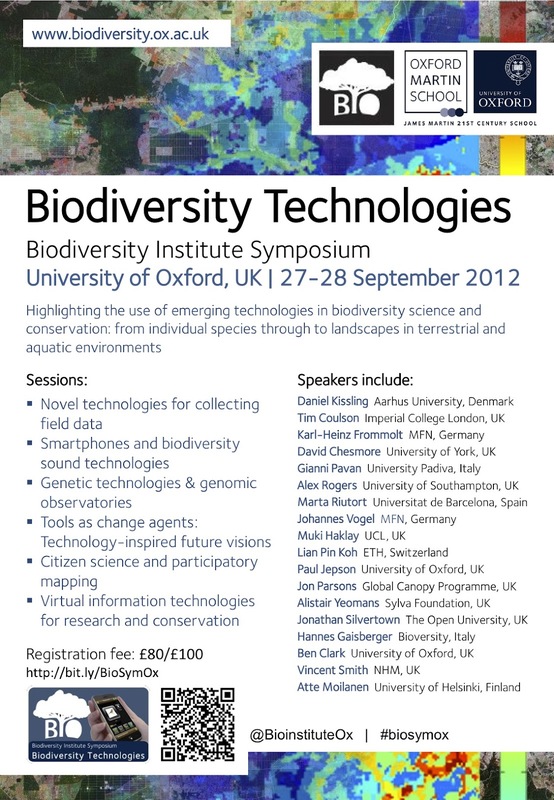 The event should appeal to all producers and users of taxonomic data. This event is free and open to all, there is no need to register for the evening meeting. Previosuly I showed how to create a new Biblio type in Drupal 7 - this code covers the next step: adding additional Biblio fields to a Biblio type in code. Not content with performing on top of Buckingham Palace - they also put on a good show. Shame about some of the other "stars" they had on before. 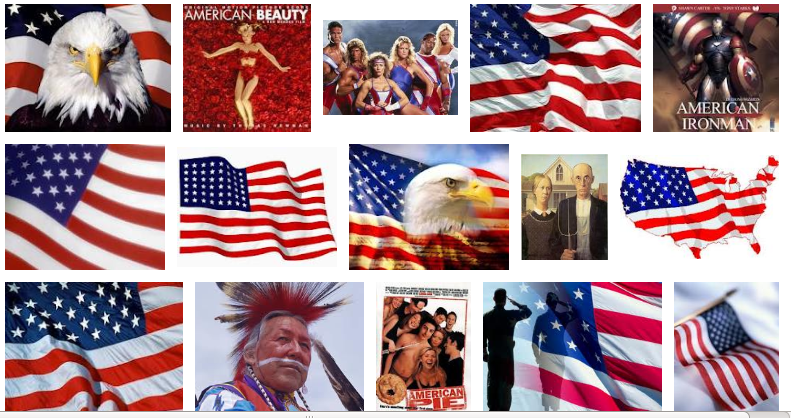 A little study of what happens when you search for "American", "African", "European" and then "Asian" on Google Image Search. Various Scratchpad sites I work with, most notably the International Commission on Zoological Nomenclature (@ZooNom) and the Natural Sciences Collections Association (@Nat_SCA) both use Scratchpads as a platform the online components of their journals (Bulletin of Zoological Nomenclature; NatSCA News). In order to provide some increased metadata to aid search engines in indexing this kind of content I wrote the Biblio Scholar module for Drupal which provides some metadata that may be used by Google Scholar (see Inclusion Guidelines) and potentially other services. Some more background to the Biblio Scholar project. "It is a measure of the newness which still infects air travel that, although once in the air it completes a journey between two points with the utmost dispatch, at the same time it condemns travellers to dreary hours of waiting and preparation on the ground; to tiresome formalities with Customs, Exchange and Immigration controls at all kinds of places, and finally to cumbersome and ponderous journeys by road to and from aerodromes. It took us two hours after leaving Victoria, to get into the air." This is just a modification of the function biblio_admin_types_add_form_submit($form, &$form_state) and run during install of the custom module (using hook_install() ). As I mentioned before, one of the things that tailoring Scratchpads to a particular community or project allows us to do is to develop functionality that is specific to that community or project. Within the eMonocot project we have developed some functionality that is useful across all of the eMonocot Scratchpads (e.g. the IPNI webservice) while other parts (e.g. the Swiss Orchid Foundation images) are useful only to a few of the Scratchpads. In order to allow site maintainers to pick and choose which subset of these functions they would like I have added a number of the optional fetaures to the Scratchpads Tools feature to make it easy for site maintainers to add/remove these functions with a single click. Two of the worst project logos from the biodiversity world. Drawn on by a child?